Planning for the 121st Audio Engineering Society Convention is well under way, with the collaboration of a stellar Committee headed once again by Chair John Strawn. 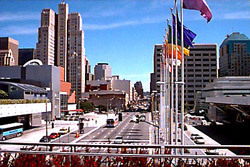 Scheduled for Oct. 5-8, 2006, in SF’s Moscone Convention Center. This year’s AES Convention Technical Program will maintain its traditional four-day run. However, AES executive director Roger Furness has announced a format change designed to meet the evolving needs of the pro audio community. “The Technology Exhibition is now scheduled for three days, October 6-8, a change which reflects well-considered exhibitor requests,” Furness said. The Full Program of the convention is now available. Travelers arriving in San Francisco via domestic United and American Airlines flights are in for a treat. The San Francisco Airport Museum's current exhibit - The History of Audio: The Engineering of Sound - coincides with the 121st AES Convention. Be sure to visit it on your way to baggage claim. For more details, visit the San Francisco Airport Museum's web site.